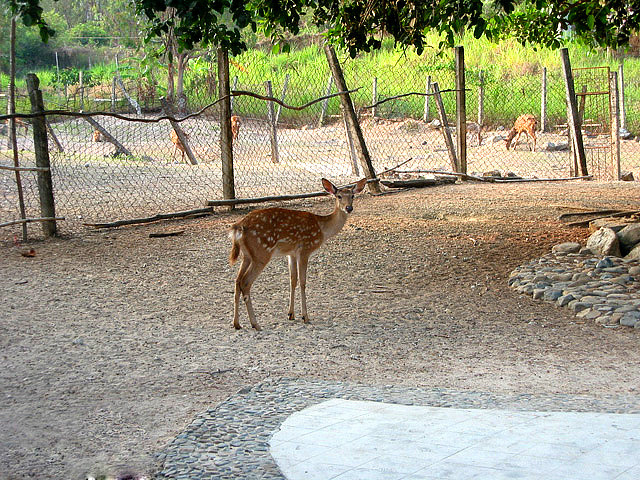 Luhuitou (Deer-Turn-Round) Park, Luhuitou (Deer-Turn-Round) Park Travel, Luhuitou (Deer-Turn-Round) Park Pictures, Sanya, Hainan Island, China. Luhuitou Peninsula is located in the north of Sanya about 5 km away from the urban city, perched on the edge of the South China Sea. A theme park in the same name is situated on the hill near the seashore. The sculpture in the Deer Park. A deer in the park. 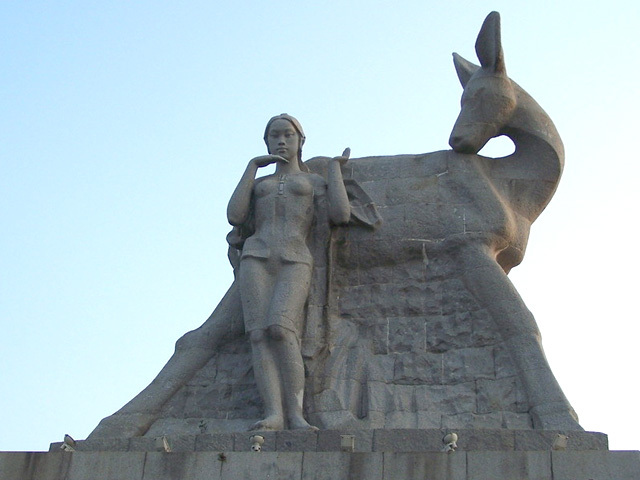 The name Luohuitou, literally "a deer looking back", is derived from a fair tale. Once upon a time, a tyrant emperor desired a pair of deer horns, so he forced a young hunter named Ahei to hunt for deers. When Ahei was hunting, he saw a beautiful deer chased by a panther. He shot the panther with his arrow and run after the deer for nine days and nine nights until they arrived at the Coral Cliff of Sanya. The deer found no way to escape. Suddenly the deer looked back at Ahei and turned into a beautiful girl. Then, the hunter and the girl fell in love and got married. In the end, the emperor was defeated and the hill became home for the couple. Today, when you are standing on the hill, you can enjoy a bird's eye view of the vast sea, the high mountains and the of Sanya city. The park contains the Observation Station for Halley's Comet, the white Tingchao Pavilion (a pavilion for listening to the tide), the romantic Lover Island and Monkey Hill among other attractions. The Luhuitou Bay nestles on the foot of the Luhuitou Mountain. There, you can dive or to swim to see schools of colorful fish and other sea animals. The beach is beautiful and suitable for full relaxation.